We have a new group of 14K gold antique pendants, just in time for the holidays! Some exceptional pieces that I have never seen anything quite like before. 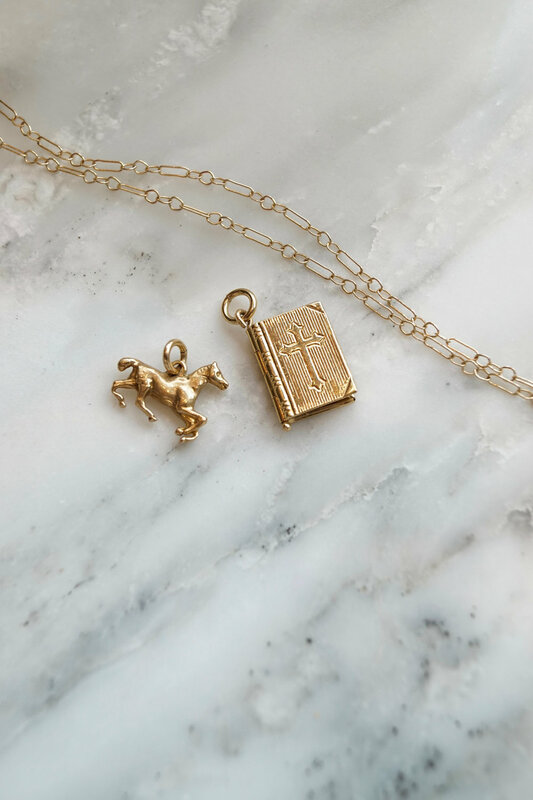 If you have an equestrian lover on your list, then we have the perfect gifts. These pendants are memorable, keepsake pieces which will become your family’s new heirlooms. The pendants pictured above are available through our Birmingham showroom. Pictured above from left to right: 14K Horse Head pendant $229, 14K Fob pendant $298, 14K Horseshoe pendant $195, 14K Horn pendant $119. These pendants are pictured added to our 14K gold 33” necklace base, $279. These two 14K gold pendants are available online. Horse pendant, $195. 14K Lord’s Prayer Locket, $298. The Lord’s Prayer book locket holds a complete script of the Lord’s Prayer inside!